December 13, 2009 Dan O. Request from my bud Matt. Keep on sending requests everyone so I can review one of yours. When Mr. Fox’s nightly raids on three nearby farms raise the ire of the selfish farmers, he must outwit the men’s increasingly outrageous plans to catch him in this animated adaption of the Roald Dahl book. As the farmers’ schemes take a toll on his hungry family, Mr. Fox must find a new way to get his paws on the bounty. Wes Anderson directs, and George Clooney, Owen Wilson, Bill Murray and Jason Schwartzman lend their voice-over talents. The one thing I may note about this film is that it has the appeal to younger children with its cute animation, and PG rating. But the jokes here will probably be too smart for children, and most likely go over their heads. I don’t think there’s anything inappropriate here, but it surely isn’t for the kiddies. Once again, Wes Anderson allows us to see the world through his eyes. I think it is so cool that Anderson can make an animated film, and you can still look at it knowing its a Wes Anderson movie. Basically anything that seems tired in a live-action movie, completely works here. Cause your not used to seeing a badger puppet do the same things that a human would do in another Wes Anderson film. The visuals for this film are very splendid. It looks so good, and very exciting. You feel like you are seeing a world with these creatures, but also with these humans and not only does it move along real well with the animation, at some points it looks too good to be true. I did like some of the humor for this film, I just didn’t think it held up quite as well in this as it does with plenty of others from Wes Anderson. There is little quirky and quick jokes that are amusing at first, but then at times the jokes feel a bit too forced and not placed all too well. Clooney as Mr, Fox wasn’t the best choice to be truly honest. I felt like he was being too much of George Clooney and not trying to be Fantastic Mr. Fox, like he was put out to be. The best job here is Schwartzman, who although is playing a young teenager, still seems believable as a teen full of angst and trying to look for understanding in his life. 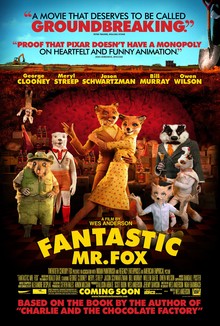 Consensus: Fantastic Mr. Fox is cute, at times funny, and visually splendid. I just didn’t feel like the jokes were too flattering, and the voices could have been a bit better. this movie is an 8.5/10. yes on the quirkyness of the animation, and the forced jokes, but over all, the movie is 3.75 stars. I know, i know. It’s just that I didn’t think that it was one of Anderson’s best, and sure as hell not one of his better attempts at comedy.